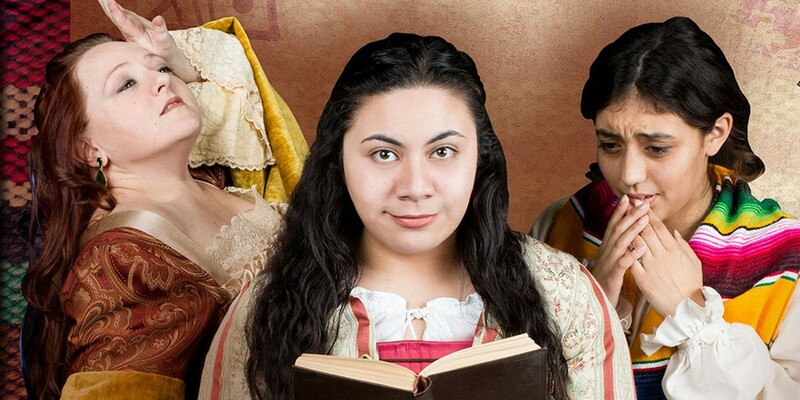 Courtesy of North Coast Repertory Theatre Sarah Traywick, Fiva Pulu and Amelia Resendez read their way through the Spanish Inquisition. In the late 17th century in what is now Mexico City, the convent of San Jeronimo was home to one of the most extensive libraries in the New World, presided over by Sister Juana Ines de la Cruz. She was a prolific and adventurous writer of poetry and plays, much beloved by the people of the town but rather less so by the Inquisitors, the morality police of the Spanish empire. By 1693, pressure from the church was so great that Sister Juana renounced her writing and two years later died of the plague. But her memory lives on in The Tenth Muse, now playing at the North Coast Repertory Theatre. Developed for the Oregon Shakespeare Festival in 2013 by Tanya Saracho, The Tenth Muse is one of those all-too-rare plays that blend historical fact and modern-day relevance without getting heavy-handed. Fast-forward 20 years from Sister Juana's death and Jesusa (Fiva Pulu), a mestiza (mixed race girl) has arrived at San Jeronimo from another convent in Santa Clara to take care of a nun losing her sight. She's joined at the convent door by a Nahua woman seeking a better future for her daughter Tomasita (Amelia Resendez) — a petition eventually granted because the girl has been baptized. Once inside, the girls meet Lady Manuela (Sarah Traywick), who has been sent to the convent by her parents for an increasingly obvious physical reason. Three less compatible roommates would be hard to imagine. Jesusa is bright and bubbly, always up for new experiences and challenging the rules (the books she brings with her are swiftly removed). Tomasita is shy, quiet and self-effacing, terrified she will be cast out onto the streets through some faux pas. Manuela is a spoiled brat who expects the other two to act as her servants. Early on in their relationship, a delicious irony emerges as the two "lower-class" girls can read and write, while Manuela is completely illiterate. All is not sweetness and light elsewhere in the convent, either. Sister Rufina (Heather Roche-Waldo) and Sister Filomena (Michelle "Chelly" Purnell) shoulder much of the day-to-day work. Filomena is frantically preparing food for an impending visit by the Inquisition, so she seizes on Tomasina's experience with native food plants but is incensed to find Rufina has brought in Jesusa to take over her duties as guardian to Sister Isabel (Queena Delany), the nun who is going blind. Mother Superior (Denise Ryles) is having none of any of this and would be happy to bang everyone's heads together given a chance. Meanwhile, the girls discover a whole other world in their storeroom quarters. Men's clothes. A lute. And an armoire full of papers that turn out to be a love story. They soon create their own private theater group where societal differences are forgotten and they're just three young women having fun — so much fun that Jesusa can't resist telling Isabel about it the next day. Isabel immediately recognizes the source of the story and is overjoyed that not all of Sister Juana's work was destroyed. Isabel in turn shares the secret with the other nuns. This turns out to be a bad decision but one from which many new opportunities and dreams emerge. The cast of The Tenth Muse is uniformly excellent. Pulu's command of the stage and ownership of the pivotal role of Jesusa is impressive and Delany's childlike distraction and tenderness as Isabel creates a wonderfully muse-like relationship. Roche-Waldo and Purnell play off of each other's opposing views and personalities with affection. It is a delight to watch Resendez's Tomasina slowly emerge from her shell and grasp what the world can offer her. Traywick develops Manuela adeptly from brat to compassionate human being and Ryles is terrifying as the Mother Superior. Rounding out the cast are Amy Beltran, Leslie Krieg and Karen Echegaray in ensemble roles. Megan Hughes' costume designs are a delight and the combined effect of Howard Lang's sound design, Leslie Kieg's music direction and Calder Johnson's lighting is an atmosphere that reminds us of the forbidden nature of performance arts within the confines of the convent. The only jarring note on opening night came from the scenery itself which, while well designed by Calder Johnson, creaked and groaned as it went through its transformations. Hopefully it will have been resolved by the time you read this. The Tenth Muse is produced in partnership with Centro Del Pueblo Humboldt and is the first show in NCRT's La Voz Project, a three-year commitment to feature one main stage production each year by a Latinx playwright. 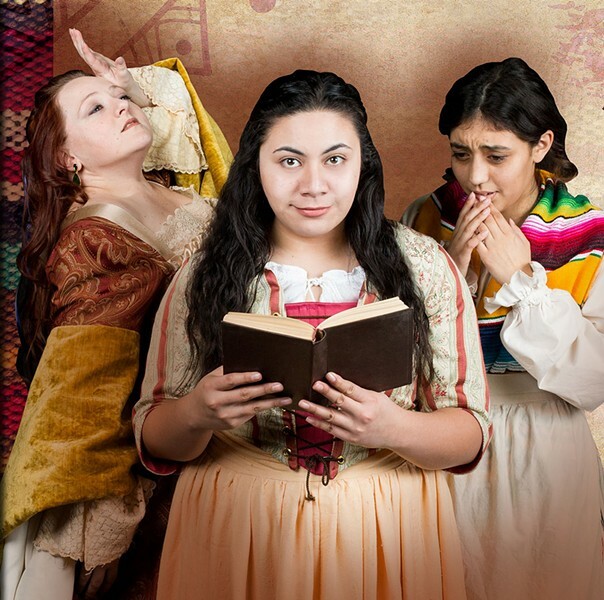 The play is directed with sensitivity by Carol Lang, who skillfully draws out the parallels between the social norms of colonial Mexico and today's issues of diversity and inequality to remind us that we are, as Jesusa says, "all the same under the skin." It's a terrific play and one of NCRT's most impressive productions in a long time. North Coast Repertory Theatre's The Tenth Muse plays Fridays and Saturdays at 8 p.m. and Sundays at 2 p.m. through April 1. Call 442-6278 or visit www.ncrt.net. Ferndale Repertory Theatre's hilarious Nunsense continues Fridays and Saturdays at 8 p.m. and Sundays at 2 p.m. through April 1. Call 786-5483 or visit www.ferndalerep.org. Dell'Arte students get serious with short original pieces during An Evening of Melodrama performances March 22-24 at 8 p.m. at the Carlo Theatre. Call 668-5663 or visit www.dellarte.com.